Exclusive! Go with the flow! 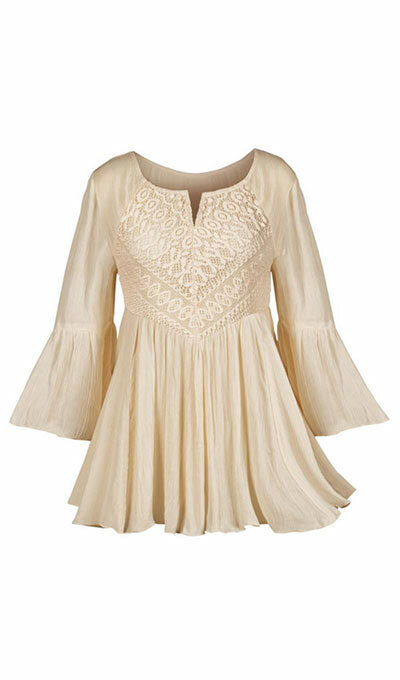 Light and airy Beautiful Bell Sleeve Blouse features a romantic silhouette with elegance in mind. Front keyhole with hook and eye closure, bell sleeves, soft gathers at the shoulder and lettuce-edged hemline. Rayon gauze with cotton/nylon lace. Machine wash. Imported. Misses, approx. 29"l in back; 26"l in front. Hurry! Quantities are limited!